My opinion on who you are doesn’t matter, not one bit. But other than maybe your wife, your kids, and your folks, no one’s opinions should matter, especially someone you don’t know. That said, be whoever you want to be, whatever you want to be, so long as it’s genuinely who you want to be. Don’t diminish this Self because of upbringing or surrounding. Don’t settle for something you know you can do, aim higher. Don’t allow society, including advertising and media, movies and online personalities, to sway what you want for yourself. Spend time thinking about your ideal, and get after it. But, at the end of the day, there’s one thing you cannot be, and that is lazy. Living is an action, not a state of being. You’re not living if you’re waiting to do something, waiting to receive something. You’re living if you’re pursuing something. The pursuit can be life. It can be what puts wind in your sails. The pursuit can be your craft, your work, improving at what your soul tells you you’re here to do, or simply what puts food on your family’s table. The object of that pursuit doesn’t really matter. It may not make you feel fulfilled initially, but as you discover the nuances of the craft or goal, as you take mastering it as a challenge, it will. Even if you don’t have an ideal or a goal, however, you cannot sit on your hands, you cannot be lazy. Laziness has never won anyone anything. It has only wasted potential and talent, made life meaningless and pointless, something that would have been better off if it were given to someone who passed at a young age or never made it out the womb. It’s poison to your existence. It takes those goals and dreams and makes them an impossibility. “If a man is called to be a street sweeper, he should sweep streets even as a Michaelangelo painted, or Beethoven composed music or Shakespeare wrote poetry. He should sweep streets so well that all the hosts of heaven and earth will pause to say, ‘Here lived a great street sweeper who did his job well.” Martin Luther King Jr.
Take pride in working hard. Take pride in doing whatever it is that you do, well. The Romans saw it as a man’s duty to be excellent in all things. That is, keep your house in order, your room clean, wake up early and work hard. Do your best in the most important aspects of your life, and those that seem insignificant. Define every aspect of your life, break them apart, and determine how you can improve in each of them. You do not have to be bad in one area to be great in another. You can be great at everything, excellent in all things; you can have it all. If your friends are poor, you’re likely going to be poor. If they’re negative, you’re likely going to be the same. If they’re envious and weak, then that’ll probably rub off, but it doesn’t have to. People state these platitudes as laws, but they aren’t. The way you live should influence others, but how they live does not have to influence you, if you don’t want it to. That said, we often curb our aspirations to fit those we’re in contact with. We settle. We see the hard work that massive success demands, and we opt instead for an easier, more mediocre lifestyle. Again, be whomever you want to be, whatever you want to be, just don’t curb your desires for fear of effort. Effort is good. Effort is life, it’s living, it’s serving, and it’s showing those who’ve sacrificed something, anything, to get you here today, alive and well. 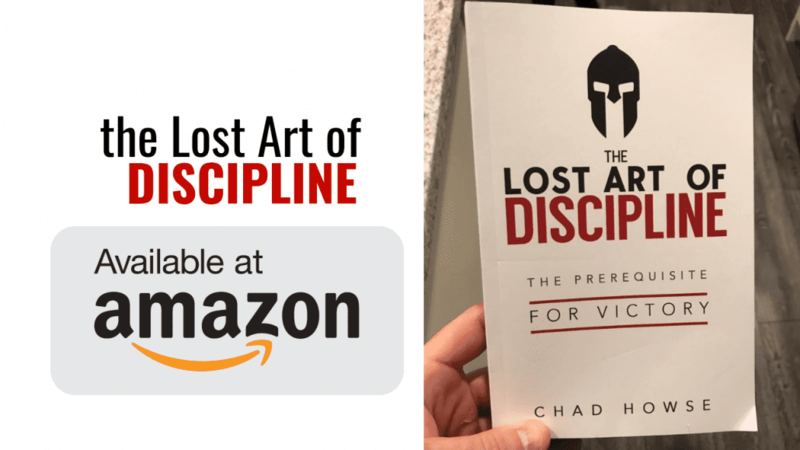 At the end of the Lost Art of Discipline (get it on amazon here) I talk about how awesome my parents are, but also that settling, setting mediocre goals and giving average effort, is more or less a slap in the face of the work they did to raise me well. If you think about it a little deeper, it’s a slap in the face of the brave men who fought in WW2, to fight against evil and for freedom, and even though I may not know them, they somehow made my life better, and my life possible. It’s a slap in the face of my grandparents on both sides, if I were to aim for mediocre goals and give average effort. We can go back to my ancestors, or the man who saved one of them, or stood up for one of them. No matter how you spin it, you and I both owe a lot of people a lot of effort to pay back their sacrifice that enabled us to be alive, that gave us the opportunities we now have, whether we’re aware of them or not. We pay back those sacrifices by working hard, by not being lazy, by moving forward, by not quitting. 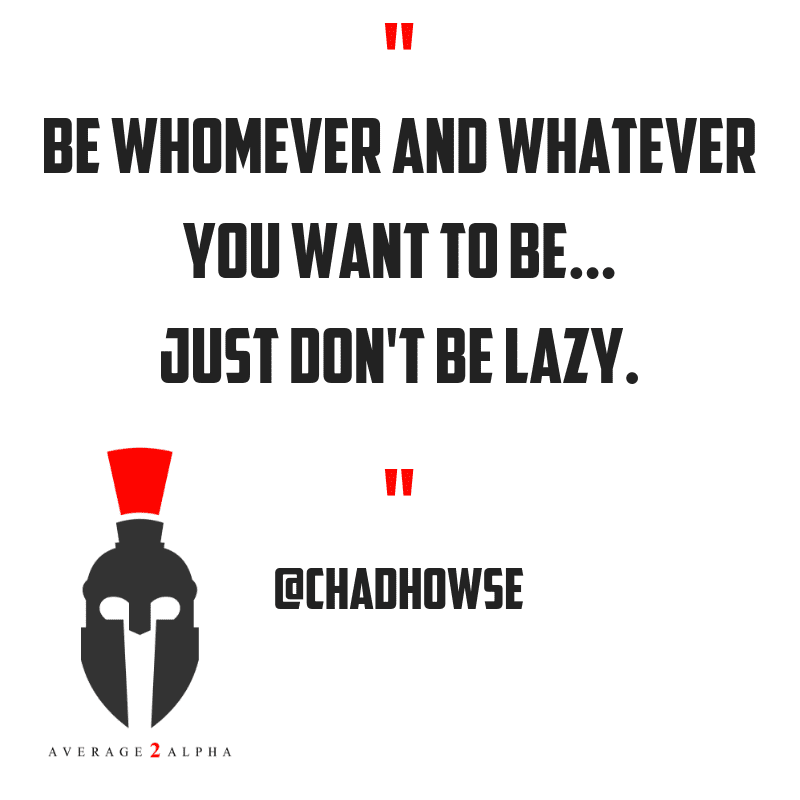 So, be whoever the hell you want to be, just don’t you dare be lazy.